Demetrios tapped into his Greek heritage at age 17 and built god-like muscles. Now he leads a bodybuilding entourage dedicated to his way of life! I played soccer until seventh grade, played lacrosse in high school, and always went on hunting trips in and around Austin, Texas. My dad, Elias, grew up in Sparta, Greece, during the Greek Civil War in the 1950s and moved to America when he was 17 years old to pursue the American dream. He pushed my brother and me to be athletic and play sports when we were young. 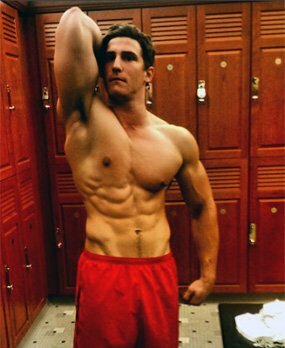 My brother started working out in eighth grade and had one of the best and strongest bodies I ever saw. His drive and motivation to be the best was my main inspiration to start working out. I was always one of the strongest people in my grade, but as I got into the later years of high school I realized I had lots of muscle surrounded by fat. So I radically changed my diet to get lean during lacrosse season and started to work out every day. I sacrificed my lunch time to get huge in the weight room below school (a.k.a. The Dungeon). After four weeks of consistent training, my friend Alex mentioned that I had a six pack. That made my day and solidified my conviction and love for iron. Since then, I've worked out almost every day and experienced gains I never thought were possible. I gained 22 pounds and shed half my body fat, which means I lost fat and replaced it with lean muscle. I became the biggest guy at school, impressed the ladies, and gained respect of my fellow lifters. When I'm at the gym, heads turn, and people respect. 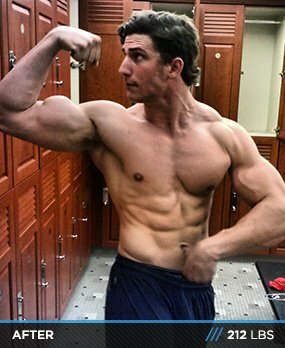 Throughout the last year of training like a maniac and eating like a horse, I was constantly on Bodybuilding.com to compare workouts, find new plans, and improve my overall knowledge. My hunger to work out and improve my knowledge and life is motivation. The gym is my life. It affected me in a big way and I started a movement at school. People see my intensity and passion in and outside the gym and are attracted to it. Now I train and advise several friends and do my best to help them experience what I have. People ask why I do what I do, and it's hard to put into words, but I train and lift because I was meant to. It's my passion and key to life. I could never live without it. When I first started, I forced myself into the gym. After a week, it became habit; after four weeks, it became a passion. The hardest part was sticking with my diet. I didn't eat badly before, but I didn't think twice about candy or a fattening burger. Cutting out those items was the hardest part of my journey. There were days when I would've killed for a bag of tasty chips, but now processed food doesn't carry any appeal. Inspiration came from my brother and my dad's eating habits based primarily from the Mediterranean diet. My motivation to work out instead of enjoying a lazy lunch with my friends came from a desire to look good and better myself. There were times when I questioned myself, but then I remembered that bodybuilding is what I was meant to do. You have to push yourself past the point of pain. Get to the point of throwing up, make every workout better than the last, and focus on constant improvement. Set goals and break them. Become an enlightened god of the gym. I diet instinctively without a set plan. I eat 5-6 small meals per day and avoid processed food. I think the best way to diet is to follow your body signals and avoid unhealthy food. I have been on Mike O'Hearn's Power Bodybuilding Program for about nine weeks. It makes me focus more on strength with higher sets and lower reps, but I don't just stick to these movements; I add my own auxiliary movements. I do abs every day and calves and forearms 4-5 days per week. When you work with heavy weight like this program, you need to take at least 3-5 minutes rest between sets to recover your strength. The aspect that challenged me most and still challenges me on a daily basis is sticking to a clean, healthy, and consistently natural diet. Dieting is a huge part of the battle to become a shredded superman. You can train as hard as possible, but if you don't nail your diet, you won't look how you want to. I plan to enter my first physique competition in July. My main goal is to become an international fitness model like Mike O'Hearn. At the same time, I would love to pursue a competitive bodybuilding career after my childhood hero, Arnold Schwarzenegger. I will obtain my trainer's license within the year to continually spread my love for weight training. Becoming world-renowned for my physique, personal philosophy, and training intensity is my dream. Never doubt yourself. You can push yourself 10 times harder than you know. Don't listen to negativity. Be open to criticism and send out positive vibes. Rome wasn't built in a day. Give yourself time to develop before you give up. Be yourself. Don't follow, lead. Don't confine yourself to rules set by others. Break the rules and be something special. For an up-and-coming transformer, the best advice I can give is to start simple. Focus on building a solid base with big complex movements like deadlifts, squats, bench press, and overhead press. Building a nice body begins with building a proportional body, and there is no better way to do that than to start with the basics. Make the decision to radically change your diet to fit your goal. Don't procrastinate or think that dieting should come later. Dieting must be your starting point. Train like a beast, eat like a horse, and sleep like a baby. When I first started to train, I had no semblance of a plan. My brother told me about Bodybuilding.com, so I decided to check it out and hit the jackpot. I reviewed the plans in the "Find a Plan" section and uncovered great information. Bodybuilding.com is the Mecca of weightlifting information and community. When I thought it couldn't get any better, I discovered BodySpace. I was like "Really? A Facebook for bodybuilders? Did I just step into heaven?" Long story short, I wouldn't be where I am without the golden nugget that is Bodybuilding.com.